“As I set out each day, I felt like a young child again. One who hadn’t yet learned the rules of manmade time; the rules of clocks and calendars, of weekdays and weekends. A couple of years after my husband died I decided that rather than wait for the world to come to me, I would go to the world, At that time I read Without Reservations by Alice Steinbach and it has remained one of my favourites ever since. So to today. I started out not knowing what I wanted to do. 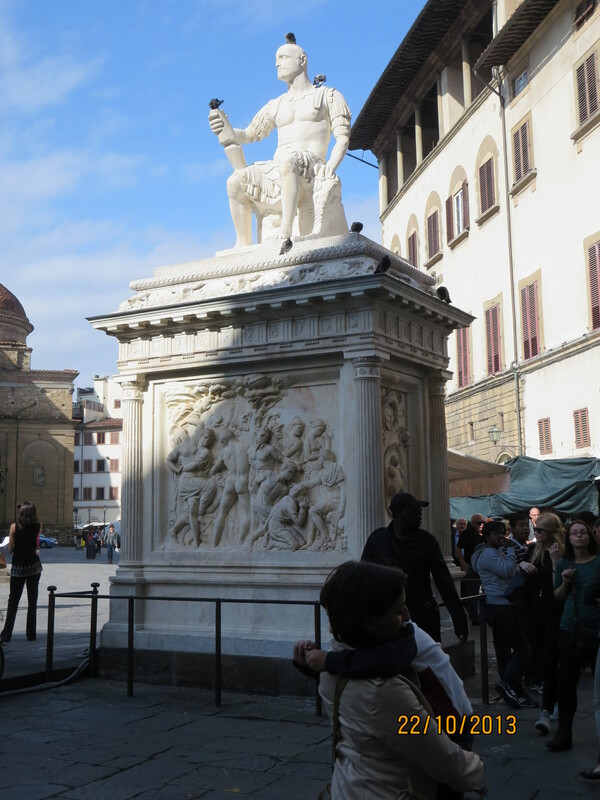 Would I go into the city and wander around, would I see if I could get into the Bargello that had been closed on each of my earlier visits or would I find that particular restaurant where I had risotto the other day for lunch and have not forgotten it. The restaurant won out. I had the card with the address on it so it should have been an easy place to find. 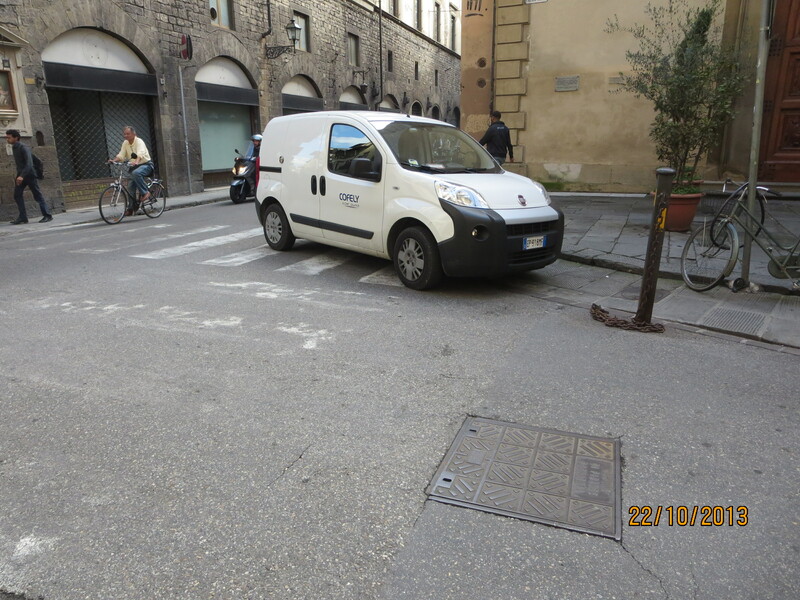 But not all streets are named here in Florence and not only that, but they change name half way along for no apparent reason. So I wandered around for a while before I found the restaurant. 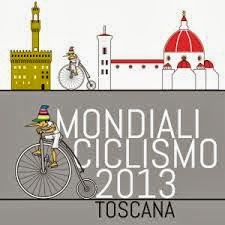 Because the World Road Cycling Championships have just been held in and around Florence the place is awash with tourist things depicting the race; hats, sweat shirts, tee shirts, bags etc. 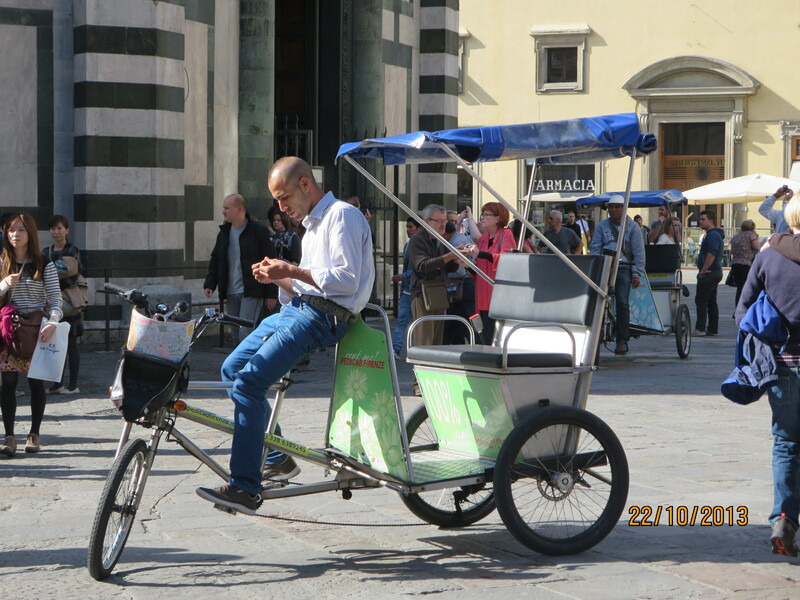 The street vendors are selling little battery operated bicycles with pedalling cyclists whizzing around the footpaths. 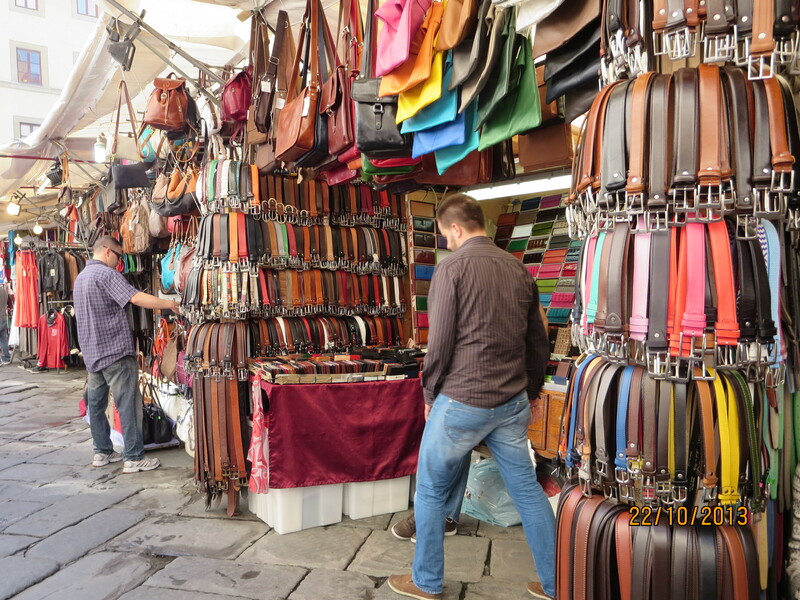 I asked on vendor “Quanto?” to which he replied “Venti” (20 Euros). I began to walk away and he said “Quindici” (15) I shook my head and asked what was the best price for two and ended up purchasing two for 15 Euros. He smiled as he took the money so I guess he made a profit on the deal. I noticed that each day the crowds seem to diminish. 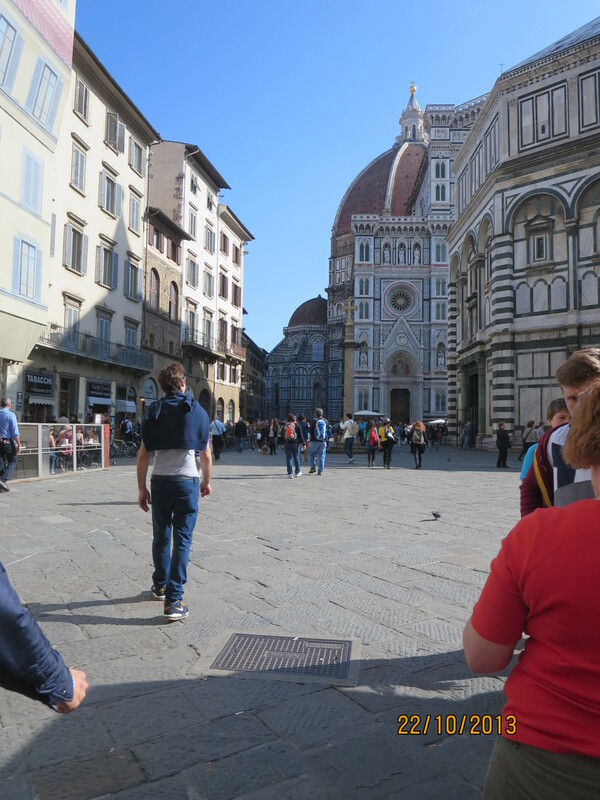 No long, long queues to get into the dome or the campanile today. The restaurants aren’t nearly as busy as they were last week. In an earlier post I described this as a screen in fact these are the doors to the Baptistry. 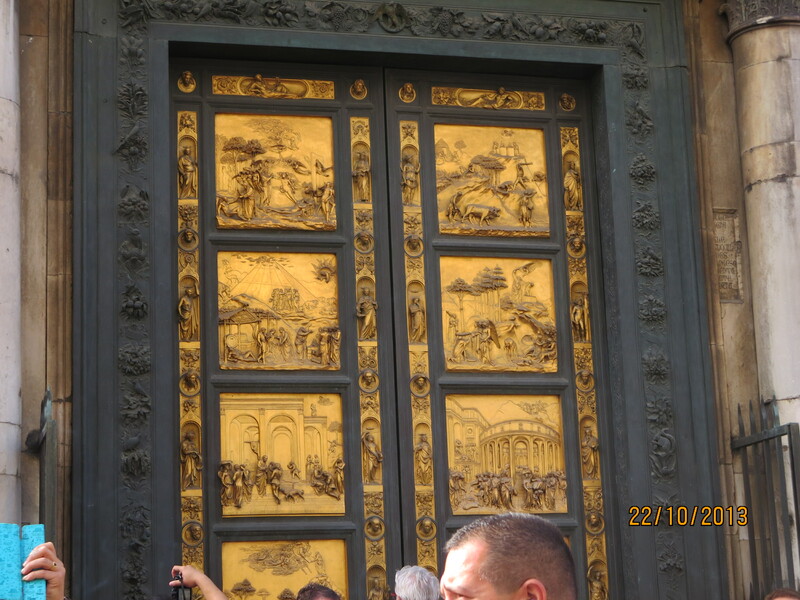 There are three sets of these doors., two sets of which were designed by Lorenzo Ghiberti after winning the competition to decide which artist would do the design. 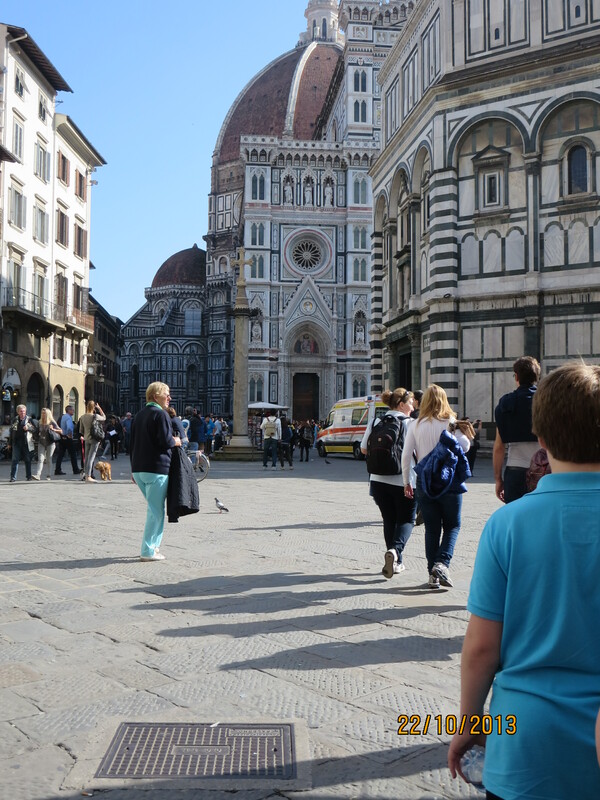 Brunelleschi, the designer of the dome, was among those who made submissions and lost out. 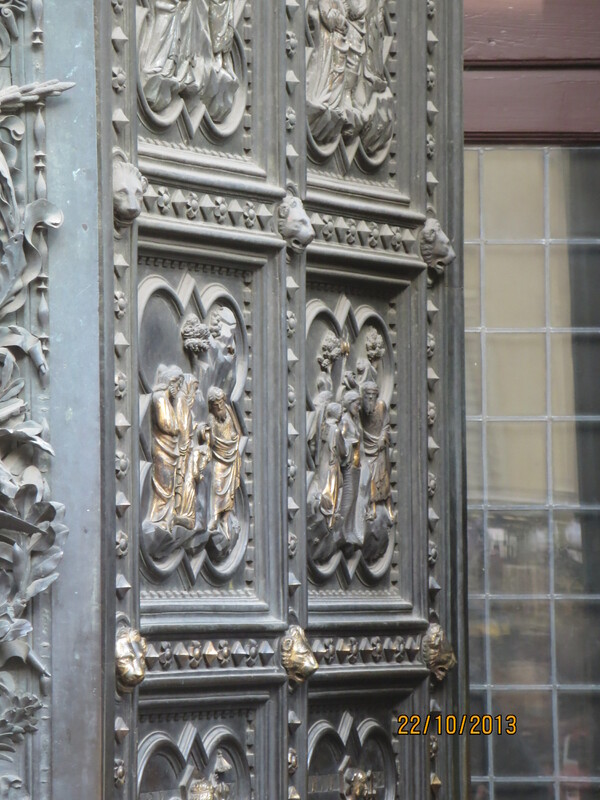 The doors illustrate Old Testament scenes and the door frames contain busts of 24 of the leading Renaissance artists, including one of Ghiberti himself. The octagonal building on the right of the picture is the Baptistry. The doors now used to enter the church are shown below. Scooters are everywhere lined up in long, long rows when not being ridden. 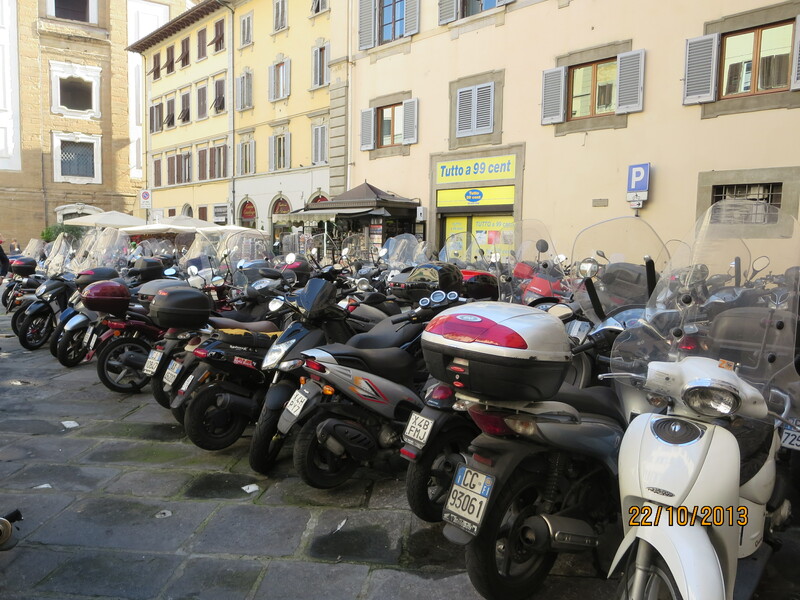 And it’s of interest to note that unlike in New Zealand, neither scooter riders or cyclists seem to wear helmets. Helmets are compulsory in New Zealand. 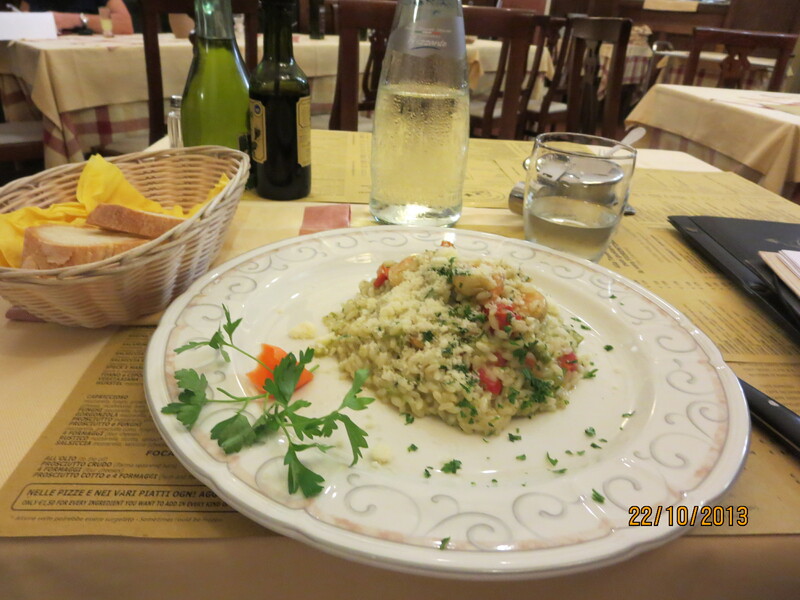 Eventually, I found the restaurant in Via Dei Neri and ordered the risotto again. Sometimes it is a mistake to return to a restaurant and order the same food but this time it was equally as good as the first. So another day in this city came to an end. I must say that all this walking is strengthening my thigh and leg muscles. The first couple of days here I was very aware how much I was walking. But now I just take it in stride. 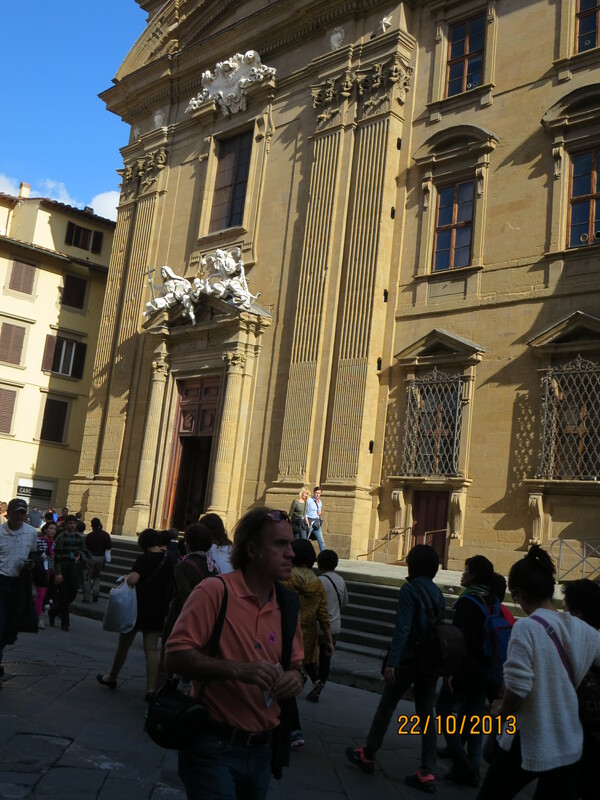 This entry was posted in Adventures, Florence, Uncategorized and tagged Baptistry, Filippo Brunelleschi, Florence, Lorenzo Ghiberti. Bookmark the permalink. 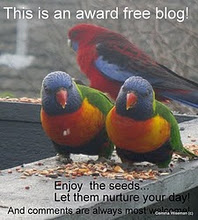 I just stumbled across your blog. How wonderful! I look forward to reading more and to following you in your travels (I’ve always loved Florence). In the meantime, I’ve ordered Alice Steinbach’s book. Thank you so much for the recommendation. Oh, I was afraid that risotto wouldn`t be as good second time around. Glad to hear it didn`t disappoint! Sounds like another winner of a day. I love the Alice Steinbach quotes. Glad you found the restaurant. Thank you for the photos and the memories they stir. 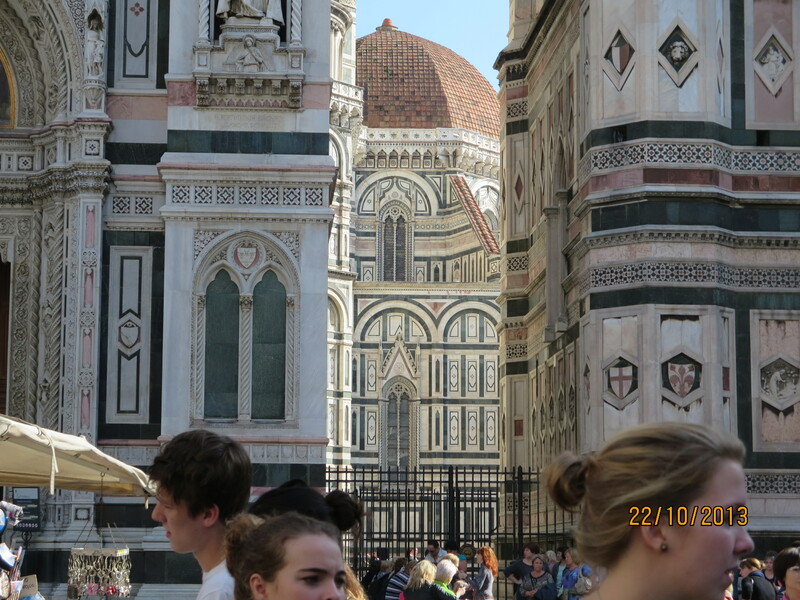 I love Florence! The serving plates are so different from what we’re used to seeing. 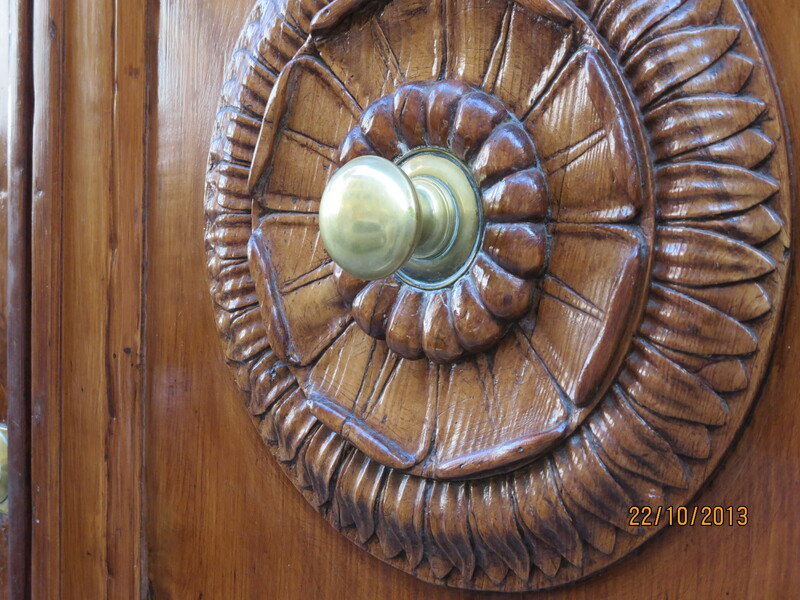 I’m awed by the detail work seen in all the architecture.